Heal Your Puzzle » Blog Archive » Does your Life have a Pulse? Do you Feel Alive? 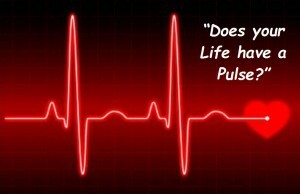 Does your Life have a Pulse? Do you Feel Alive? I have recently been wondering what it is about certain experiences that make you feel Alive with a capital ‘A‘ ?! …the times when your surroundings seem to have more colour and vibrancy… and you feel more connected to everything around you… has anything changed about you? Your sensory perception? Is it real or illusory? Is it possible to feel such connection all the time and really Live Life? ‘Life‘ is conventionally defined as: “the condition that distinguishes animals and plants from inorganic matter, including the capacity for growth, reproduction, functional activity and continual change preceding death”. When you read this definition, does it fill you with passion and excitement??! Isn’t truly LIVING about being ENTHUSED with LIFE??!! … And enjoying every moment??!! And even if not ‘enjoying’, be truly engaged with what is happening around you… ‘keeping your finger on the Pulse’? Professionally and personally, this has taken me a long time to understand what both these ideas really mean, what is happening within when we experience them and what they look like when working with someone’s Energy Field… What am I actually trying to achieve? What is this Fully-Engaged Feeling of ‘Alive-ness’? Shouldn’t this be the ultimate goal of ‘Healing’? The definition of ‘Life’ above relates to our Physical Body… and Medical Sciences focus on the response of this to treatment. We are far more than just Physical Energy however; for True, Real Enjoyment of Life and Healthy Wellbeing, the Mind and Body (consciously and throughout the sub- and super-conscious) need to be fully engaged with each other before fully interacting with the Environment (our surroundings and each other)… this is what is referred to as being truly ‘One with the World‘. This not only has to happen with our Thought Processes but more importantly with the more complex mechanism of Feelings, which have a greater influence on our behaviour. All holistic therapies to a greater or lesser extent work with this aim of healing and reconnecting us to our Whole Selves; ill-ness and dis-ease are symptoms of this process and will ebb and flow until One-ness is achieved. At this time, Science cannot measure such Consciousness Energies or their interactions and of course mainstream treatment protocols have to be based on proven techniques but one day it will be measurable… 🙂 Until then Holistic Therapies backed up by therapeutic experience, gathered evidence and feedback underpin this Process. By our intention, we evolve. Let’s all focus on achieving being One with the World, living in harmony with each other and really embracing and enjoying everything! Why not??! !